Those who grow weary of daily needle-delivered doses of certain medicines may soon have a new option: researchers at the Massachusetts Institute of Technology have spent 15 years developing an implantable microchip that will do the job—sans the mean poking. Human trials started last year in Denmark, and the results of the in-body test were published in the Feb 15 online edition of Science Translational Medicine. From pacemakers to artificial hips, people are getting used to having new technology placed in their bodies, but imbedding microchips still raises hackles. People living with type 1 diabetes know the importance of maintaining their regimen of insulin injections. Women suffering from osteoporosis, on the other hand, do not feel the results of missing treatments as readily as diabetes patients. The osteoporosis hormone therapy cannot be swallowed as a pill because it works when sent into the body in specific, discrete amounts, as would be provided by an injection rather than through steady time-release capsule that can be swallowed. According to the Los Angeles Times, 70 percent of osteoporosis patients don't keep up with their daily hormone therapy injections. "Compliance is very important in a lot of drug regimens, and it can be very difficult to get patients to accept a drug regimen where they have to give themselves injections," says MIT professor Michael Cima. "This avoids the compliance issue completely, and points to a future where you have fully automated drug regimens." The team at MicroCHIPS, the company that the MIT researchers helped form, used their wirelessly controlled implanted microchips to deliver the Eli Lilly & Co's hormone teriparatide to eight Danish women aged 65 to 70 over the course of 4 months. In one of the cases, the microchip did not properly release the drug and that woman did not complete the study. The other seven women, however, showed measurable improvement in bone formation. The chip contains a collection of pinprick-sized reservoirs of the drug of interest, capped with a layer of gold nanoparticles that dissolve when hit with an electrical current, releasing the drug into the system. The chip itself is the size of a small coin, inserted under the skin near the waistline and programmed to empty its minuscule wells of hormone on a specific time schedule. While the chip reportedly causes no discomfort, the bodies of these women did recognize the chip as foreign and covered it with a fibrous coating. This minor encapsulation did not prevent the drug from being released into the system. MicroCHIPS hopes to eventually offer chips that can hold hundreds of doses, and the company will spend the next several years refining this technology and working toward FDA approval. 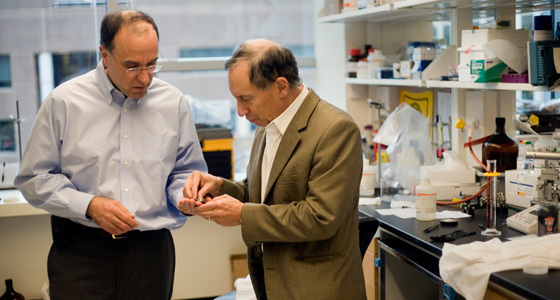 "You could literally have a pharmacy on a chip," says MIT professor Robert Langer, who cofounded MicroCHIPS. "You can do remote control delivery; you can do pulsatile drug delivery; and you can deliver multiple drugs." MicroCHIPS is not alone in health-related microchip technology. Positive ID Corp—the company behind VeriChip—announced last July that it had finished the development of its GlucoChip, a glucose-sensing microchip that would monitor the glucose levels of diabetics. As convenient as this technology may be, people are still leery about putting microchips into their bodies. Implantable microchips have been previously offered for health purposes, but were rejected by the American general public. In 2004, the U.S. Food and Drug Administration approved the implantable VeriChip, a radio frequency ID (RFID) tag. VeriChip was marketed as a way to quickly identify patients brought to the hospital unconscious or in other ways incapacitated. The chip, placed under the skin in the upper right arm, gave doctors quick access to patient identity and medical records. Serious privacy concerns conquered the marketing of VeriChip in America, however, where many worried the technology would eventually lead to mandatory chipping of citizens for identification purposes. Others saw the microchip as a step in the desensitization that would lead to global acceptance of the Mark of the Beast. Other countries have not held microchips with the same level of suspicion. Even before VeriChip was approved by the FDA, the chip was marketed in Mexico as a tool for identifying children and potentially rescuing them from kidnappers. In October of 2011, Positive ID announced that the Israel Defense Forces had made a VeriChip order to help with "emergency situations and disaster recovery…"
The medical convenience of microchipped medication may or may not win out over the concerns of wary citizens, but as technology continues to provide new ways of dealing with old problems, we may see more silicon offered to our bodies than comes from a simple day at the beach.